Baoding Manlakay Trading Co., Ltd. is located in Jingxiu District, Baoding City, Hebei Province, China with rapid economic development. Baoding is in the central part of Hebei Province, as well as the center of the Beijing, Tianjin and Shijiazhuang triangles where the Beijing-Guangzhou Railway passes through. Since was established, the company has always been adhering to the business philosophy of “Quality determines the market, service creates the brand”. We make every effort to ensure the quality, expand by providing high quality products efficiently with high starting point and strict requirements. People-oriented enterprise management is pursued in the company， so are continuous innovation and deepening reform. Science, management, quality and efficiency are integrated into every aspect of business management. Baoding Manlakay Trading Co., Ltd. has become a rising star in the sales of glass crafts in North China and even in China. The company's predecessor is the Golden Sunshine Glass Craft Products Factory with more than 20 years of glass production. It has its own senior R&D team and excellent product quality, and enjoys a high reputation in the industry, in order to better develop the international market and the company. Baoding Manlakay Trading Co., Ltd. was established in the long run. Relying on a strong production base and high-quality partners that have been developed over the years, our products are based on far below the market price, strict product quality and perfect after-sales service, and strive to continuously improve and serve every customer! The primary products of Baoding Manlakay Trading Co., Ltd. are Glass Bongs, Glass pipes and Hookahs. Other various glass products such as Glass hydroponics vase, tea sets, wine sets, condiment containers, and various alloy hookahs and other hardware products are also provided. Established a good partnership with many well-known glass manufacturers，our company has occupied a large market share of domestic high-end glass crafts, especially glass smokers. Our products have been exported to Europe, the United States, Canada and many other countries and regions. With the goal of “Creating a World Brand and Building a Hundred Years of Enterprise”, all employees regard product design innovation and product quality as the cornerstone of enterprise development, and actively make progress. Under the support of domestic and foreign customers，we are working hard to make Baoding Manla. Kai Trading Co., Ltd. become a shining pearl standing in the world's glass processing industry. 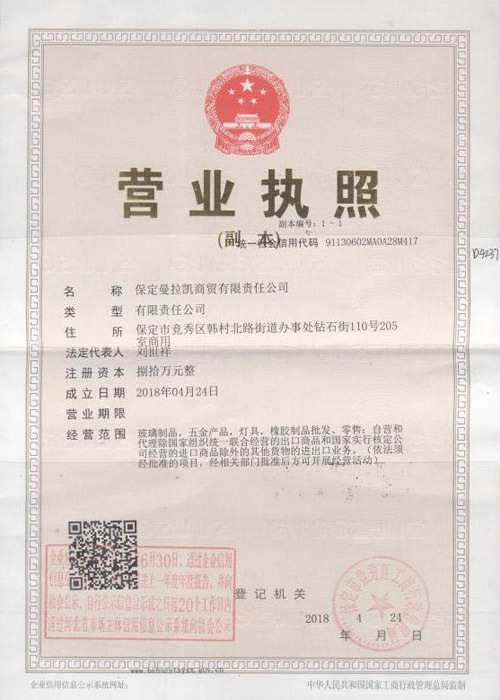 The integrity, strength and product quality of Baoding Manlakay Trading Co., Ltd. have been recognized by the industry. We welcome all friends to visit, guide and negotiate business!